Pennsylvania Family Institute Shift funds away from Planned Parenthood because of their gap in services. President Trump is working to invest in community health centers by redirecting funding that currently goes to entities that provide abortions – like Planned Parenthood. In Pennsylvania, there are only 25 Planned Parenthood locations spanning 16 counties compared to the over 300 community health centers spanning 52 counties. Over 11,000 women offered prenatal care at FQHCs compared to zero by Planned Parenthood. Over 25,000 mammograms at FQHCs compared to zero by Planned Parenthood. 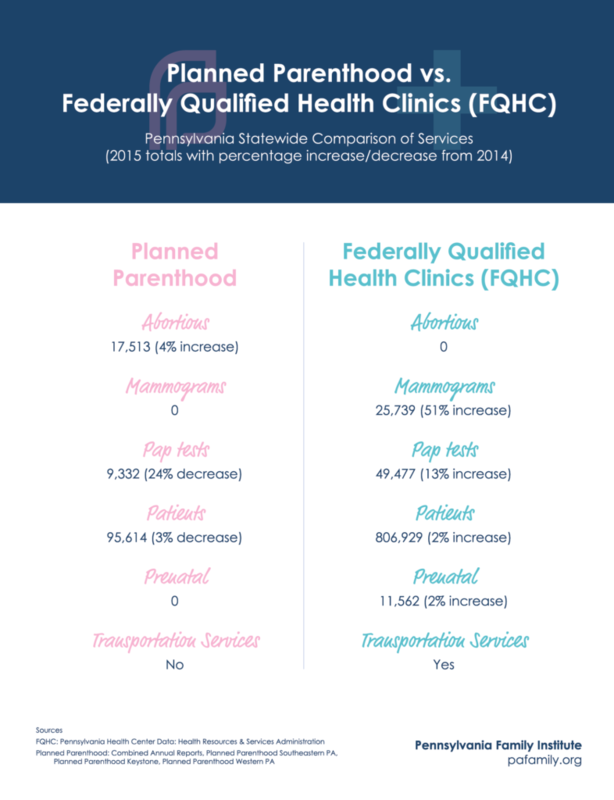 No direct involvement in abortions at FQHCs compared to over 17,000 abortions by Planned Parenthood (55% of all abortions in PA). Investing in community health centers over Planned Parenthood in President Trump’s proposed budget is a win for women and families. SB 300 has been introduced here in Pennsylvania to prioritize state funds. It would prioritize the allocated state funding for family planning services in order to invest in the best care for women. It would also prohibit funding to entities that provide abortions, like Planned Parenthood; who cover over half of all abortions in Pennsylvania. Tell your State Senator to support SB300. Click here to contact.